The Tabard of Frost is an epic tabard with very impressive and detailed graphics. The artwork is identical to that of the other epic WoW TCG tabards, but is blue and black in color. It has no item level, so it can be equipped by even your level 1 banker alt! This is a very striking tabard that will no doubt have others emoting /jealous. Tabard of Frost counts towards the Twenty-Five Tabards achievement. 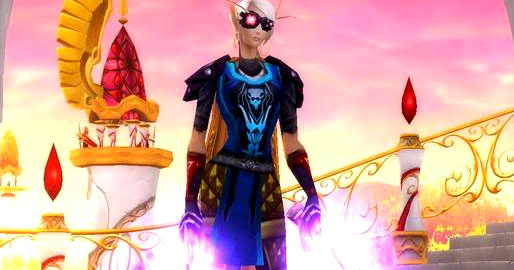 The Tabard of Frost was a reward from the long since retired UDE Points program. The only way to obtain one of these fine looking tabards is to purchase a loot code for one that has yet to be redeemed. These show up on ebay from time to time but they tend to be on the expensive side. Be prepared to pay over $300 for this extremely rare tabard loot. 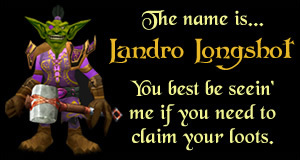 If you're fortunate enough to claim a loot code, the Tabard of Frost can be acquired in-game by visiting Landro Longshot in Booty Bay to redeem your loot code.